We clearly state, “Employees are essential assets” in The Nabtesco Way. In order to share the company’s ideal image of the human capital where it is the people who make the company, and to define the direction that all employees should follow, the Nabtesco Group established the Basic Policy on Human Capital Development and has been providing a range of educational opportunities in line with this policy ever since. Develop personnel who can think and learn on their own at all times as members of a global corporate group, and create a culture that values and supports learning. * The number of trainees above includes also trainees from subsidiaries. We provide new graduates who have joined the company with intensive training in a planned and systematic manner during their first three years of work, deeming this time to be optimal for enhancing their basic skills. Specifically, we provide them with annual training programs in consideration of their individual growth stage, thereby helping them to improve year by year. We also give new employees on-the-job (OJT) training, believing it to be important to offer them hands-on work experience so that they can become an effective members of the workforce as soon as possible. Under the OJT system, OJT staff members provide careful instructions to individual trainees, while the trainers themselves also receive training to maintain their high ability to provide such instruction. 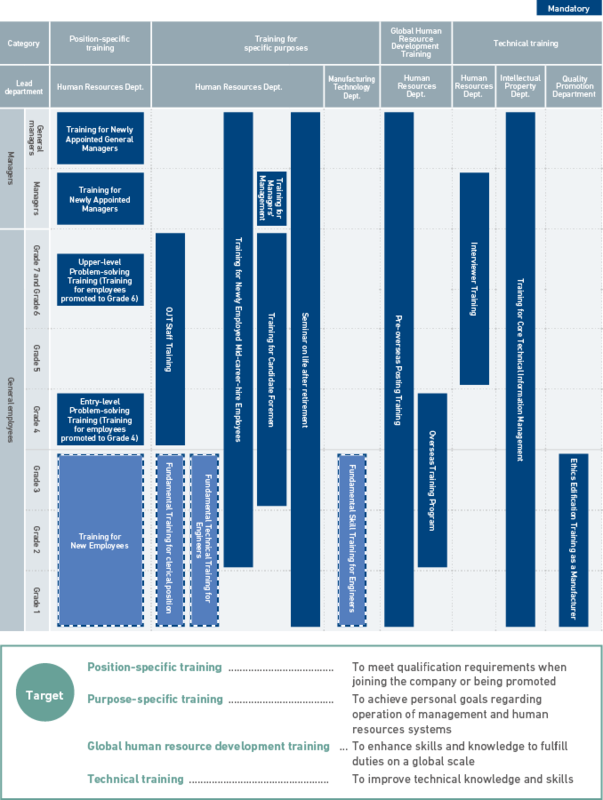 In addition, a common training plan worksheet designed to visualize the contents and progress of the training is used for all trainees to create a uniform, high-quality training environment. As overseas business is expected to continue to expand, it is becoming increasingly important to develop globally competitive human capital. We introduced a system to register in advance employees slated to work overseas so that we can provide them with essential training in a planned manner. It also builds a database of the experiences of those actually working overseas to share useful information on overseas work among employees, thereby enhancing the entire Nabtesco Group’s global abilities. We organize regular trainings for English writing, presentation and developing skills for meetings in an international setting, as well as an intensive study camp for English conversation to provide our employees with opportunities to gain and improve basic English language skills required for global business communications. 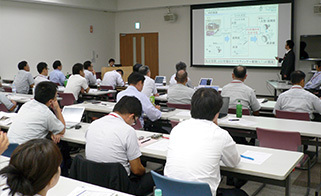 In FY2012, we introduced the “Overseas Trainee Program” in which our employees can study and work aboard. By the end of FY2017 we had sent a total of 19 employees overseas under this program. In addition, in 2017, we also introduced overseas job training mainly involving the employees who have worked for Nabtesco for more than three years. The Nabtesco Group is proactively endeavoring toward the development of human resources at Group companies outside Japan. For example, we are implementing various training programs aimed at improving the skills of locally hired personnel. In China, we provide business management trainings for executive candidates at business locations to promote the appointment of locally employed staff for managerial positions. 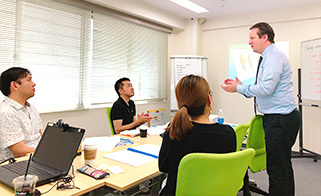 In addition, we offer an OJT-based training programs designed for skill enhancement, in which employees of overseas Group companies are assigned, for a certain period of time, to factories in Japan belonging to various business segments, including the railroad vehicle equipment, hydraulic equipment, commercial vehicle equipment, and automatic door businesses. By offering opportunities to deepen their understanding of the Nabtesco Group’s corporate culture and The Nabtesco Way that supports it, and to learn specialist skills, we are developing workers who can contribute to economic development in their home countries. We will continue these efforts to reinforce our overseas operational bases and to contribute to the economic and social development of the countries in which we operate. We established the Nabtesco Way in October 2012. It is a collective term that signifies our Corporate Philosophy, Our Promises and the Action Guidelines, which has been shared by all employees to support each employee’s work and judgment. Its aim is to increase the sense of unity in the Nabtesco Group and facilitate even better cohesion. In FY2017, for the second year in a row, we held a focus workshop tailored to the participants’ attributes to deepen their understanding of and attunement with the Nabtesco Way. Our 2017 organizational diagnosis showed that attunement with the Nabtesco Way remains largely unchanged. It also made clear that satisfaction with communication within the organization has been rising by the year, which is why we made communication the core of our activities to reliably create more awareness about, understanding of, and attunement with the Nabtesco Way. In concrete terms, we organized workshops for stratified and goal-specific training in addition to the abovementioned focus workshop. By having participants share with each other what they thought was positive about their workplaces and what they felt was “typical of Nabtesco” in their work, and relating that with the Nabtesco Way, we helped them understand the goals and background of the concept as well as sympathize more with its various aspects. We have also been holding the “Nabtesco Way Month” annually in April since FY2013, as a time for raising employee awareness about the Nabtesco Way. 4,124 employees at 442 workplaces and 11 group companies in Japan participated in the fifth Nabtesco Way Month in FY2017. Way meetings were held at everyone’s own workplaces, allowing participants to discuss and share about the Nabtesco Way as well as how they related it with their own experiences and daily musings. * The calculation scope covers only Nabtesco Corporation. * We use the indicators “Relations between senior and junior workers” and the “State of the organization” which represent a degree of communication within the organization (The surveys have been continually conducted in FY2013, FY2015, FY2017). * We evaluate above two indicators according to seven grades (1: Completely disagree; 2: Disagree; 3: Somewhat disagree; 4: Neither agree nor disagree; 5: Somewhat agree; 6: Agree; 7: Completely agree) and rate the results (4 or more is defined as satisfied).